Norwegian Fjord Cruises - Which One To Consider? Norwegian Fjord Cruises – Which One To Consider? While cruising through some of the Norwegian Fjords, you will be held spellbound by their beauty. A fjord is a long body of water that rests between two cliffs which were created by glaciers. While cruising through this beautiful mountainous area, you will have amazing panoramic views. When planning a Norwegian vacation, one should definitely consider taking one of the many lengthy Norwegian Fjord cruises that are offered by a multitude of cruise lines. Most cruise lines offer several different European cruise deals when you book your cruise. Some of the best deals will include room upgrades, discounts on shore excursions and onboard credits that may be used on almost anything while aboard the ship. Many times the cruise line may also have other amenities included in the price of the cruise, so be sure to talk to your travel agent about discounts and offers. When deciding which of the Norwegian Fjord cruises, one of the most popular choices is the Princess Scandinavian cruises. The starting price is about $2,799.00 per person for an 11-night cruise. Travelers will have a chance to enjoy the beautiful ports of Geiranger Fjord Tromso and Spitsbergen to just name a few. While aboard the ship, guests will be able to make use of the activities and amenities such as the pools, lounges, restaurants, theatre, casino, spa and much more. One of best Norwegian Fjord cruises is the Hurtigruten cruises. Travelers are able to visit the ports of Geiranger Fjord, Alesund, Trondheim, Lofoten Islands and Tromso. 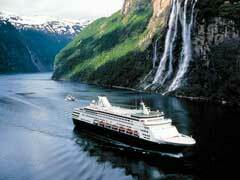 This cruise line offers Norwegian Fjord cruises beginning at about $1599.00 per person. In addition to the ports visited, there are about 2-3 days at sea where you will have access to all of the amenities of the ship including the lounge and bar, restaurants, fitness center and much more. While at sea you are able to take full advantage of everything the ship has to offer. These are just a couple of choices that are available when planning your vacation visiting the majestic and beautiful Norwegian Fjords. It is important to plan ahead in order to get the very best deals that are sure to make your vacation is everything you are expecting it to be.